With an Introduction and Notes by Professor Roger Cardinal. University of Kent at Canterbury. Translationsare by Paul Desages (Around the World in Eighty Days) and Arthur Chambers (Five Weeks in a Balloon). JULES VERNE (1828-1905) POSSESSED that rare storyteller's gift of being able to present the far-fetched and the downright unbelievable in such a way as effortlessly to inspire his reader's allegiance and trust. This volume contains two of his best-loved yarns, chosen from among the sixty-four titles of Les Voyages Extraordinaires, Verne's pioneering contribution to the canon of modern science fiction. Around the World in Eighty Days (1873) relates the hair-raising journey made as a wager by the Victorian gentleman Phileas Fogg, who succeeds - but only just! - in circling the globe within eighty days. The dour Fogg's obsession with his timetable is complemented by the dynamism and versatility of his French manservant, Passepartout, whose talent for getting into scrapes brings colour and suspense to the race against time. 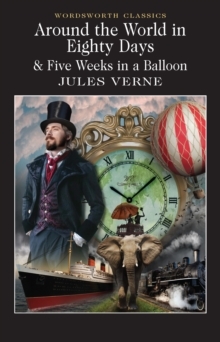 Five Weeks in a Balloon (1863) was Verne's first novel. It documents an apocryphal jaunt across the continent of Africa in a hydrogen balloon designed by the omniscient, imperturbable and ever capable Dr Fergusson, the prototype of the Vernian adventurer.